When should you use radiation resistant lenses? CONVENTIONAL optical elements like lenses and prisms can suffer from degradation when exposed to high energy radiation, with the glass they are made from gradually turning brown or grey in colour, reducing their optical transmittance. These ‘browning’ issues may be experienced in applications including space research and the nuclear industry including reprocessing, as well as medical and scientific situations where gamma, electron, proton, and neutron radiation is experienced. The phenomenon of reduced transmittance is usually worst around the UV-visible part of the spectrum. In situations where optical glass is subjected to ionising radiation, it may be advisable to use glass specifically hardened against the browning effect. This stabilisation is achieved by dosing the glass with the dioxide of Cerium (Ce), a ‘rare Earth’ element (atomic number 58) also used as a catalyst. Cerium-stabilised glass is denoted by the letter G followed by the number in the suffix of the glass name, with the number being ten times the percentage by weight of Cerium dioxide (CeO2) in the glass. A glass labelled BK7G16, for example, has 1.6 percent by weight of CeO2 to stabilise against radiation. 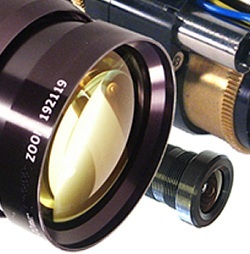 Resolve Optics offers a range of non-browning lenses and radiation-resistant endoscopes for use in areas with very high radiation, and has produced a technical note to help address the question of whether a specific application demands the use of this specialised glass.